I have not been able to title my latest works yet. For the time being, I have called them ‘wooden cabinet with various objects’. They were put together as part of a specific exhibition for the Manchester City Gallery to be held in July, 2002. The theme of the exhibition is ‘New Indian Art: Home, Street, Bazaar, Shrine, Museum’ and it has been curated by Gulammohammed Sheikh and Jyotindra Jain. The idea of working with cabinets and objects has been on my mind for more than four years now. I went to Porbandar in 1997 to visit Mahatma Gandhi’s birthplace, Kirti Mandir. I noticed that Gandhi’s personal effects, documents and old photographs were all kept in shallow wooden cabinets roughly six inches above the floor. These are often seen at other memorials and museums as well. I have always been fascinated by the way the belongings of a person who has shaped all our lives are collected and displayed in this manner. Over a span of time, these objects and the people they belonged to become part of our collective memory. So when the invitation for this exhibition came along, I proposed this concept and decided to explore it. I put together nine such cabinets, along with additional photographs and a teepoy. In selecting these objects, I was trying to create a kind of museum of contemporary and recent history. Over the last four years, I have also become more interested in social and political events. When I did the series on Gandhi in 1997 to commemorate the 50th anniversary of India’s independence, I remember wondering what exactly we were celebrating. The Gujarat carnage this year gave a much sharper focus to this sense of disquiet and dismay which already preoccupied me. How can any sensitive person not respond to what is happening in Gujarat today? All my life, I have believed that India has a unique culture that enriches all of us and, therefore, communal riots sadden me. Try to put yourself in the place of those who have suffered — the violence, the homelessness, the loss of faith in fellow human beings... can you imagine being afraid of your very neighbour? I moved to Bombay many decades ago, but I still have very close links with Gujarat, especially Saurashtra. Everything about the place, the Kathiawadi language and the way people live is very dear to me. It is not that I am parochial about my culture — my family and I are very open to other influences. For example, as a teenager I remember watching Bengali films by Satyajit Ray, Mrinal Sen and Ritwik Ghatak on Doordarshan on Sunday afternoons. My entire family would watch these films. But at the same time, I am very proud of my roots in Gujarat. I go there very often and feel very happy when I have to go there on work. The fact that Gandhi was also a Kathiawadi fills me with pride. Apart from the wooden cabinets themselves, the other objects I have chosen also have a context. Take for instance the different kinds of birds I have used. The constant conflicts over land and property, whether in Kashmir or in Ayodhya, makes them unhappy with the way things are. So these birds are a metaphor for the soul, our souls trying to find purity and gentleness. 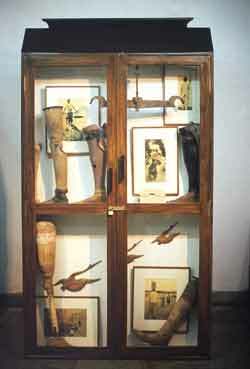 I have also used artificial limbs that have actually been used by people. Photographs that I have treated and distorted are also a part of the exhibition. There is a portrait of my father and grandfather. My grandfather’s photograph has been dipped in tar so that only his eyes remain visible. There are images of Gandhi too. I have also borrowed some seductive images from the world of films and glamour, such as the eyes and lips of actresses. I think this kind of provocative glamour contributes to the uneasy tension that surrounds us all the time. Like — like a sort of constant buzz of excitement. My other theme revolves around building homes. This is an activity that shows how much we long for security. There is something good and positive about this kind of building activity. So I have used objects like the thaapi (spade), hammers and sieves to convey this context. There is also a photograph of a little girl, Shyamala, whose eyes were sold. I came across this in a news item and blew up her photograph and painted over it. In this way, I have tried to link the seemingly disparate experiences of contemporary Indian life and by bringing these objects and images together, I seek to understand the world around me today. I feel particularly sad when people from the region I belong to and love so much play a role in causing these conflicts in places like Ahmedabad. I cannot understand why they have to manifest their feelings in this way.